France is the birthplace of cinema and has played a major role in the history of film: from the time of the world's first public showing of motion pictures by the Lumière brothers in 1895, through the Nouvelle Vague of the 1950s and 60s, to today with its healthy indigenous film industry. France is the world's third largest film market, behind the US and India, and Paris is the city with the biggest number of cinemas per inhabitant in the world. These are mostly multiplexes run by large corporations, but some of the auditoriums where cinematic chefs d'oeuvre are shown are themselves works of art. Among the best known are La Pagode, Le Grand Rex, and Le Louxor, all three registered as historic monuments of France. They deserve a visit, whether to watch a film or just to admire the architecture. La Pagode (the pagoda) is an independent cinema which was originally built as a gift from the manager of the nearby department store Le Bon Marché to his wife! Built in 1896 in the style of a Japanese pagoda, it served as a ballroom and a banquet hall until it closed in 1927. 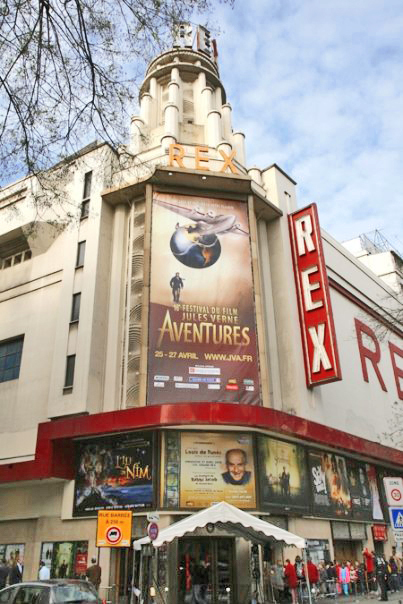 Four years late it reopened as a cinema — the only one in the 7th arrondissement — serving up reruns of hit films to the local community. In the 1960s it started to specialise in "art" films and quickly became a temple for cinema enthusiasts. With the advent of the multi-screen cinemas in the 1970s La Pagode was one of the few small cinemas to resist closure. It is now run as part of a small network of independent cinemas, Étoile Cinémas. 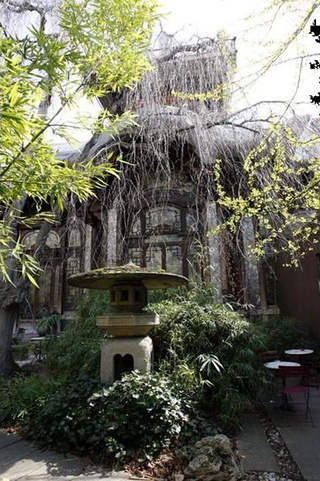 Uniquely in Paris, La Pagode has a small garden attached where you can enjoy tea, coffee or cocktails surrounded by Japanese greenery. Le Grand Rex was built in the 1930s in the Art déco style, inspired by great American entertainment venues such as Radio City Music Hall in New York. Originally designed to hold 3300 spectators it has a current capacity of 2650. The décor of the main auditorium is in a neo-baroque style with antique sculptures, pergolas and a starry ceiling. Three smaller auditoriums were added in the basement in the 1970s. 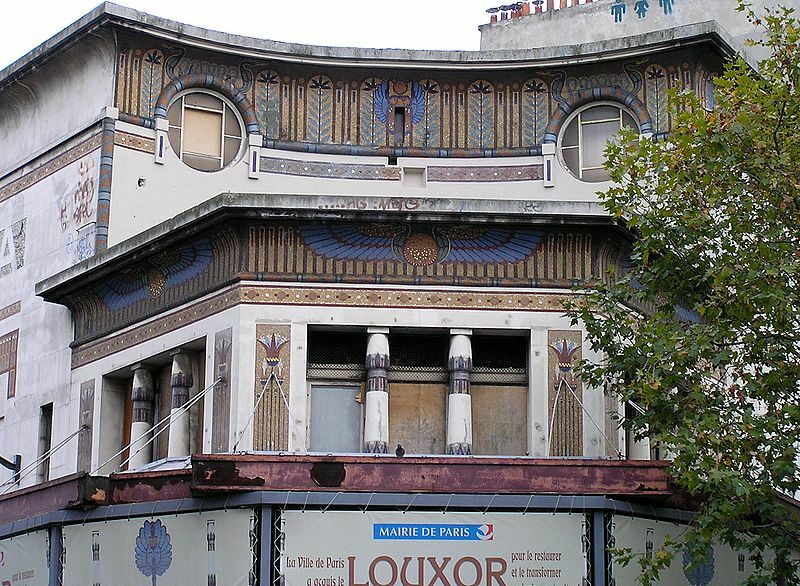 Le Louxor, named after the city of Luxor in Egypt, is a remarkable example of ancient-style architecture from the 1920s. Its neo-Egyptian façade is decorated with mosaics in blue, gold and black. The auditorium was modified several times in an attempt to keep up with the changing trends in cinema — including a phase where it specialised in "exotic" films in the 1970s — but was sold in the 1980s and converted into a night club. In 1987 it became the biggest gay club in Paris called Megatown. When that club closed in 1990 the Louxor was abandoned and fell into dereliction. Threatened with destruction, local associations fought to save it from ruin and the City of Paris bought the building in 2003. A project to restore the roof, façade and interior began in 2010 and is expected to be completed by 2013. The Louxor will be reopened as a cinema with its main auditorium reduced in size, but with the addition of two new screens, an exhibition room and a café. However, the cultural programme is still under discussion between the City authorities and several associations. Tu aurais aussi pu parler du Studio 28 à Montmartre, toujours en activité, mais c'est surtout l'intérieur, le hall, qui est intéressant. Il y a aussi Le Studio Raspail, bd Raspail, de style Art Déco, aujourd'hui privé, mais en l'état. De même le St Germain des Près. Mais ils sont moins spectaculaires que les 3 dont tu parles. Jordi, je sais que tu connais très bien les salles des cinéma de Paris, et par tes commentaires tu partages tes connaissances. Merci! Je veux que mes articles servent d'introduction aux divers sujets. Ensuite, libre aux lecteurs comme toi de contribuer un point de vue ou des détails.